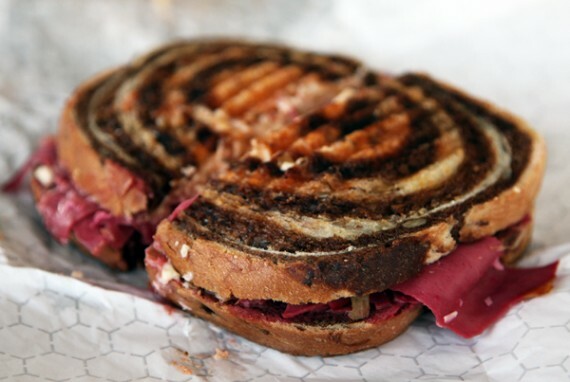 I’ve never seen a reuben look so, well, reuben-y. It makes the Angelica Kitchen version even more laughable. P.S. Daiya makes everything better. damnit! 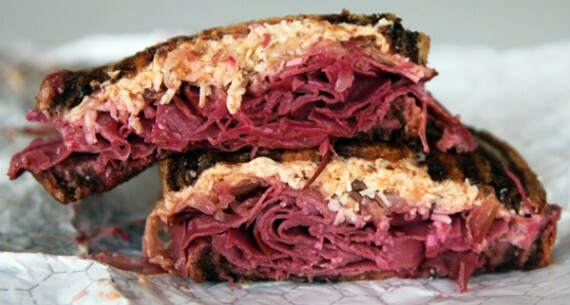 After seeing that picture I MUST have a Reuben for lunch!!! The salad on the other posting bored me but THIS looks GOOD!!! I must say, I have had most of the vegan reubens you mentioned and this definitely looks like the best. It’s about time you wrote about this one! I agree, handsdown winner. Whoa. What kind of fake meat is that? I need that! I ordered this from Locali last week, and I think I can agree it beats Follow Your Heart, my old favorite. Like Matt, I’d really love to know what fake meat they use because it is so good. The menu says tofu slices, but I think that’s a mistake. It is a bit thin for a Reuben but I will give it a try. i think i want to roll around in a room full of them. Yeah, the Locali reuben really is the best in LA. They just go above and beyond with the amount of ingredients, and Daiya makes a huge difference. If only Follow Your Heart were not married to using their own horrible cheese they could do a much better job. i hearby declare this sandwich to be the best reuben in LA! it is the king of kings!! the future destroyer of my waistline! my kombucha made me a little drunk. weeeeeeeeeeeeee! 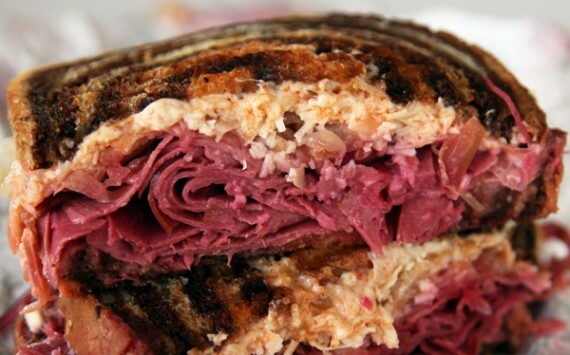 Now THAT is a Reuben…and I want it NOW! peeps who are asking, the faux meat is tofurky slices that have been marinated! i sampled some quiche at locali about a month ago…damn it was good. i don’t usually comment, but i actually got this today and it was uhhmayzing. i had never even been to locali b4 and didn’t know they served actual food. just great. Besides great treats! The staff at Locali are very helpful and friendly! WOW, what a concept. Why does LA have 6 places to get a vegan Reuben and there’s not ONE in NYC??? WTF do we pay these rents for???? now THAT is a sandwich. will go there asap! thanks for finally declaring a favorite because i was waiting on it haha! i just posted about a sanwich too, check it out! I never would have thought to marinade tofurkey. I know what I’m doing this weekend. Just had the Vegan Reuben at Locali with my girl last night. OMFG! It was AMAZING!!!! If QuarryGirl has a “Must Visit Vegan List” in the future, this place needs to be placed on the list!!! Thanks to Locali’s Groupon, the boyfriend and I tried their Reuben sandwich on NYE. The boyfriend is still loyal to Cafe Flourish’s Reuben, but he agreed that Locali’s Reuben is pretty good. My girlfriend and I ate here today. I got the Reuben and all of the reviews have been spot-on! This thing was massive in size and flavor. It was seriously amazing! My girlfriend got the Little Italy sandwich (tempeh meatball sandwich with Daiya and marinara), which was delicious as well. We spoke with the owner a little bit, who was an awesome guy and gave us a both a generous sample of the ginger slushies. Oh, and we say Jason Behr (of Roswell fame) go in and buy some vegan mac and cheese, so take that for what it’s worth! Ok….Had my first Locali Reuben…..damn, damn, damn…. I have always liked the FYH Reuben, but this just blows it out of the water. Now the wife and I are arguing because I am dissing the FYH one.